Kate Spade Canada has a promo code deal going on right now where you can save an additional 30% off sale styles! Use the promo code SUNSHINE at checkout today to get this deal until Tuesday, July 5, 2016. Prices are in USD. 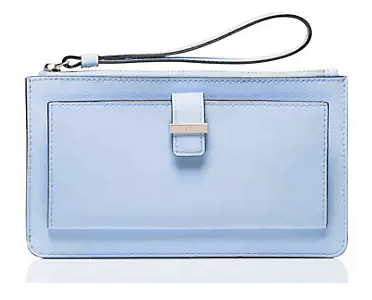 Pastel colours are a Kate Spade signature colour, get this cedar street Karolina wristlet for only $56 USD (was $100 and on sale for $80). It is made with an interior slide pocket, exterior fold out, and 5 card slots. Also you can get this beautiful say yes better half bracelet, which was originally $48 and on sale for $38; with the promo code discount, get it for only $26.60 USD! Kate Spade Canada has $10 USD shipping to Canada.